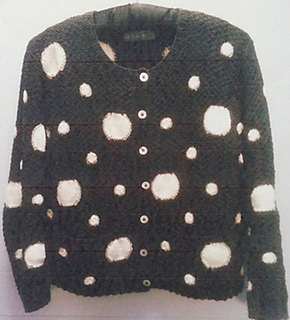 The Circles Cardigan is a variation on the Circles Sweater, with a shorter length and a button-through front. The Circles Cardigan has a surface design with a textured background and intarsia circles encased with travelling stitches. The silhouette is a simple straight shape with crew neck and long set-in sleeves. For the Lambswool or Cashmere version the yarn required is 7 x 50g balls in the main colour, 1 x 25g ball of Angora in the 1st contrast and 2 balls in the same yarn in the 2nd contrast. The cotton version will require 8 x 50g balls for the main colour and the same contrast amounts as with the wool and cashmere versions.